Ella had her very first "Big Girl" bath last night! Up until this point Hayden and Halle have been taking baths together while I bathe Ella alone on her yellow sponge bear. Since she is sitting up well now and since Hayden is getting older we decided that it was time for him to go it alone and for the girls to have tub time together. Hayden wasn't very excited about being excluded but we gently explained to him that he is such a big boy now and that it was a treat to get the bath or shower all to himself. Ella loved sitting up and splashing around in the water and Halle loved playing the role of "Big Sis", helping me wash Ella. 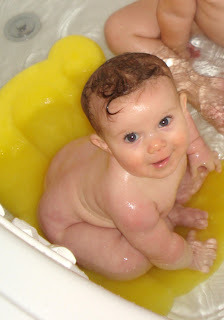 It wasn't very long ago that Ella hated bath time and I dreaded bathing her. During the first couple of months baths usually lasted all of 60 seconds while I frantically scrubbed, rinsed, and toweled her off. What a difference a few months make! She now loves the water and has turned into a bonified waterbaby! The whole crew, freshly bathed, and ready for bed! how cute and fun. I am glad she likes bath time now. I am blessed Sydney loves baths and Daniel loves having her in there with him. Love love the shot of just Ella looking up at you in the bath! so stinking precious!!! 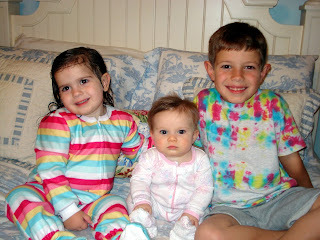 BTW, Anna has those same striped jammies as Halle...too cute!